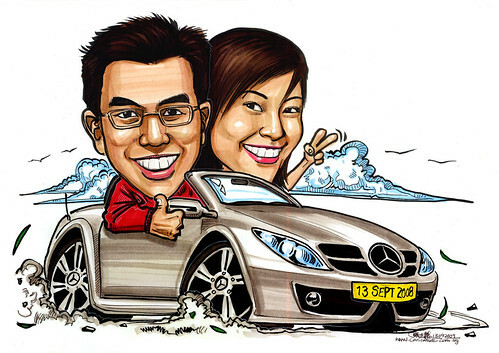 "My idea is basically to do up a caricature as a gift to her as we are celebrating our 1 year anni soon. I have seen some that you have done with the couple in a car and quite like the idea of that theme. I have included a picture of the car in which I hope you can use for the theme. Just want to give you an idea of what I have in mind, however, do not feel as though its a lot of restrictions from me. I understand that its art and you need to have some freedom to do the nice work that you do. But just for the purpose of giving some guidelines and a better idea of what my preferences are, I attached 3 pictures which are actually taken from your blog. They are numbered 1,2 and 3. This is my feel for the 3 pictures. - I like the one with the mini (1) most as I like the angle of the car in the picture as compared to the positioning of the red Honda (2) and silver Merc (3). - The position of the 2 heads in (1) and (2) are better than (3) as the gap between the 2 heads in (3) looks quite odd. - What I don't like about the mini pict is that the face of the guy is slightly obstructed. Thats basically my feel. Please dont feel restricted by all these points I made. I am also willing to explore any ideas you might have. Additional stuff that I am thinking of is putting our anniversary date on the number plate (13 Sept 2008 or 13/9/2008 or 13-9-2008). As for hands, dont really like her holding on to flowers. Other options like thumbs up, v-sign, wave, etc all look ok. Color of car can be silver, or something close. I believe the 3 picts that I took from your blog are colour marker caricature? If yes, then thats the type I want for mine too. As for size, is it a standard size? I only see the pricing on your website but it doesn't indicate the size of the artwork for that price. I will also want a soft copy of the artwork for keepsake." Surprisingly, this time, the silver (grey markers used though) tones turned out quite promising. One of the reasons could be that I have a full range of the greys. Another reason coule be the control of lighting in the rendering, with the help of a good photo given.